BRAIN POWER: "I like to write down my goals and go after them," says Rhoden, with members of the Jamaica Tallawahs below. IT’s minutes after 2:00 pm when Leneka Rhoden swans into the hotel lobby, looking cool-girl chic in skinny black jeans, a sleeveless top and a black headpiece that’s a cross between a tam and a turban. Supermodel-thin and impossibly tall with next to no makeup on and lots of easy-breezy charm to spare, she’s the high-school classmate you’re happy to bump into after too long, eager to catch up on old times. 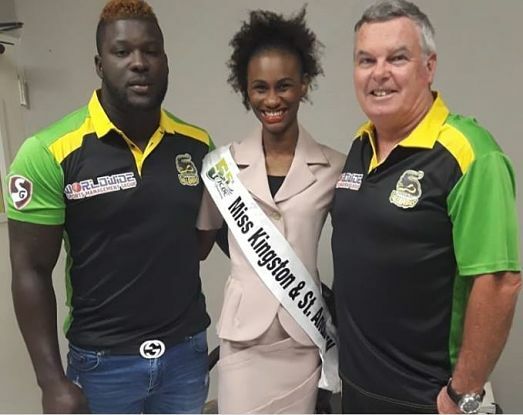 But, as we come to learn, a proper conversation with Rhoden, the reigning Miss Kingston & St. Andrew Festival Queen, is the intellectually stimulating kind. She’s what you call a brainy beauty. Prepare to hear words and phrases like “blue economy,” “desalination” and “sustainable development,” the subject that will form the basis of her Master’s degree programme next year, as long as all goes according to plan. You know before she even tells you: academics has always been her forte “I’ve always performed well academically. 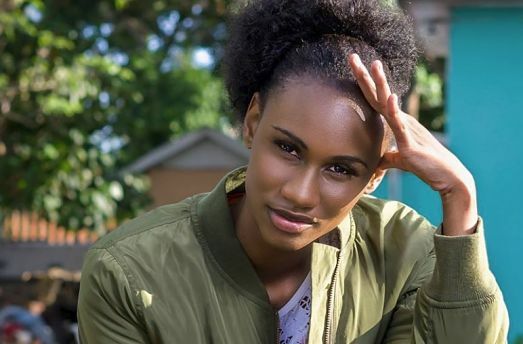 And at the university level, the pressure is on, especially when you have to keep a scholarship,” says the Queen’s High alumna, who is in her final year at UWI Mona, majoring in Marine Biology with a double minor (International Relations and Human Geography). At 21, Rhoden is a full-time student juggling her studies with many side projects, including E-Biome, her months-old company that tackles socio-environmental issues. “Our mission is to use science and technology to help propel development,” says Rhoden, who is keenly interested in developing proposals for grant funding around issues concerning ecosystem management, etc. So far she’s caught the attention of a few local companies and has done work with such celebrity clients as Sizzla (for whom she supplied biodegradable items for a party he was throwing in Portland) and Barrington Levey, with whom she collaborated for the launch of his Roses FM project, getting equipment cleared at the wharf, with the aid of culture and entertainment minister Olivia ‘Babsy’ Grange. Rhoden originally hails from out East (Bull Bay/Harbour View) and was raised by her mom, a trained geriatric nurse and teacher (now working as an entomologist with USAID), who became her daughter’s first role model. “My mom is an educator, so education and academics became a priority for me,” she says, looking back. Evidently, Rhoden is well on her way to becoming such a formidable lady herself. The former Students’ Council president and school board representative, who was practically harassed by friends and well-wishers to enter the Festival Queen competition because of her numerous attributes, keeps her goals in sharp focus. After the Master’s she’s going after the PhD. “I want to see how I can help the country achieve some of its long-term goals. I’d love to visit Africa and Bangladesh to learn more about their economy and their urban geography,” says the go-getter who was voted Most Active in the Community at the National Festival Queen finals this summer. But Rhoden is not all bookworm. She’s into the Marleys, Chronixx and Ding Dong. “I’m not a nerd! I’m very free-spirited. I’m interested in the arts in general,” she says, laughing, playing her own defense attorney. But she does admit that when hanging with friends they are surprised by the depth of her reggae/dancehall knowledge. “I love to embrace my Jamaicanness,” is how she puts it.